Odisha has successfully deployed geo-synthetic tubes along its coast to tackle sea erosion. The geo-synthetic tube, a soft engineering technique in contrast to the hard engineering options like sea-wall, is first of its kind in the State. The 505 metre-long coast, which has been covered with geo-synthetic tubes, is expected to be proof against strong sea waves. The tube has installed along the coast at Pentha in Brahmansahi gram panchayat in Kendrapara district. The Integrated Coastal Zone Management Programme (ICZMP), which implemented the project with the help of IIT-Chennai, claimed they had gone for piloting geo-synthetic tube technology as hard engineering structure had many disadvantages including its high cost. Last year, geo-synthetic tube project had hit controversy when one structure had ruptured. Subsequently, IIT-Chennai rectified the problem with its technical input. Mooted in 2008, the project had faced different hindrances, including the issue of forest clearance, coastal regulatory zone regulations and transportation of material to the coast during past 8 years. It needs to be mentioned that Odisha coast is fairly stable as only 10 per cent of the coast is highly erosion prone. So it provides a very good opportunity for sustainable planning and management of the coast. 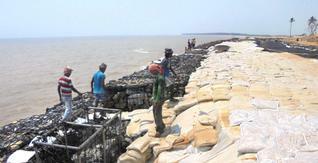 But in district like Kendrapara and Jagatsinghpur, the threat of coast erosion is very high. Interventions such as saline stone-packaging and breakwaters, structures which are constructed on coasts are traditionally made as part of coastal defence. The geo-synthetic tube solution is expected to bring much relief to a sizeable population residing along coast. Executive Engineer of the saline embankment division of the project, Purna Chandra Raththe said the project envisaged a 505-metre-long wall consisting of 241 geo-tubes. Odisha is the second state in the country to have undertaken such a project on a pilot basis after neighbouring Andhra Pradesh, the official said. Past studies indicated that more than 36 per cent of the coast in Kendrapara faced threat of erosion, the problem being most acute near habitations such as Pentha and Satbhaya in Kendrapara.